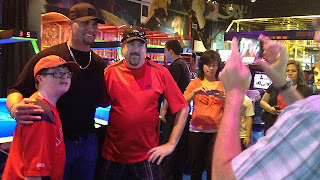 "This is my daughter, Isabella," Albert Pujols told more than 200 parents and kids in the second-floor arcade of the ESPN Zone in Downtown Disney late Monday afternoon. "She's 15 years old, and she's perfect. Sometimes she doesn't clean up her room, but that's OK."
Isabella has Down syndrome. Anybody who is in any way associated with Pujols, or has followed his career, or wants to understand what he's all about, knows this by now. He doesn't hide it; he embraces it, shows it off, uses it as a platform to get the word out and has basically built the Pujols Family Foundation around her. During the last six years of his St. Louis tenure, Pujols used the interactive events of his charity to connect with other people with Down syndrome. Monday, the day before he was to face the Cardinals in a headline-grabbing reunion, the Down syndrome community of Southern California was formally introduced to the Angels' slugger -- and Isabella. "It's really cool, because all parents with children with Down syndrome have a bond; there's an automatic bond there," said Patty Hynes, whose 23-year-old daughter has Down syndrome. "Then you see a famous person like Albert Pujols, and you're like, 'We actually have a bond with him, too.' You'd think that's the least likely person that you would have a bond with, but it's there, because we're all parents of a child with Down syndrome." The Pujols Family Foundation, quickly entrenching itself in the first baseman's new home, provided five hours of unlimited arcade games and ice-cream sundaes for 100 youngsters with the genetic disorder that affects Pujols' youngest daughter. Pujols shot hoops -- "You know, I was a point guard in high school," he said proudly -- played first-person shooters, signed giveaway posters, posed for countless photos and sported an unwavering smile. Come Tuesday afternoon, Pujols will be doing something he dreads -- answering questions about his 11-year reign with the Cardinals and soaking up all the attention during a three-game series. This -- amid the clanging of air-hockey mallets and the smell of chicken nuggets -- was a far more comfortable setting. "This is my passion, man," said Pujols, whose Angels were off on Monday after a 6-0 road trip through Detroit and Houston. "I get involved as much as I can. Obviously, during the season, it's a little bit tough for me because of my schedule. But when we came up here today, I was very excited, looking forward to it. This is one of the many events that we're going to do, but also this is probably the first one that I was able to make. To be able to participate -- that's my passion, that's what we love to do with our foundation. Seeing so many families and kids here, it's awesome." Pujols' first date with his wife of 13 years, Deidre, was at a Cheesecake Factory in Kansas City. It was there that she told him about her 3-month-old infant daughter with Down syndrome. And it was there that Pujols promised to love her like his own. Now he wants to get to know others in Orange County. "That's our goal, and it's going to be a process," Pujols said, seven days before hosting a golf tournament in St. Louis to raise money for his organization. "It took us three or four years in St. Louis before we really were able to grow like that, even though we had good people there. And that's our goal [in Southern California]. It's our second year here, we've done several events, but our goal is to try to continue, not just here in Southern California, but in Tennessee and Kansas City and hopefully all over the country and in the United States. That's our dream." Alden Gonzalez is a reporter for MLB.com. Read his blog, Gonzo and "The Show", and follow him on Twitter @Alden_Gonzalez. This story was not subject to the approval of Major League Baseball or its clubs.